Bring your little ones to the Environmental Education Center for fun science and nature programming. 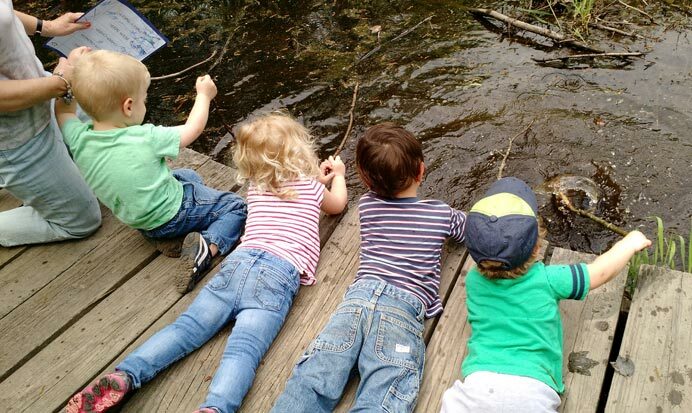 These two-and-a-half hour afternoon classes will enhance learning by going outside for hikes, hands-on activities, meeting live animals, and learning by experimenting. Each month has a different theme. Please provide a small snack for your child. Waterproof boots are a must in the swamp. Please dress for the weather. Join us for a day of exploring Cherry Valley National Wildlife Refuge in nearby Stroudsburg, PA! We will hike 3.5 miles through beautiful wetlands, grasslands, and rolling hills of forest while birdwatching on this former golf course tract. Bring binoculars and lunch. September is a great time to go out and look for bugs! We will hit the gardens and trails to look for butterflies, praying mantises, beetles, and other neat bugs! Observation tools will be provided. Exotic bugs from our building collection will also be shown and if time allows we will read a fun story about bugs! We are sure to have a bugtastic time in this program! Grey Towers is the ancestral home of Gifford Pinchot, first Chief of the US Forest Service, twice governor of Pennsylvania, and a founding father to the world of conservation. Tour the first floor of the mansion while hearing stories of the Pinchot Family and their impact on the environment. Walk through the hillside of trees Pinchot planted almost 100 years ago. Enjoy a picnic lunch while taking in vistas of beautiful fall foliage. On the way back, dependent upon time and weather, we will stop in Milford to see the historic town. Join a Naturalist and explore the nocturnal world of these fascinating raptors. Whether with long or short ears, barred or great horned, these raptors are truly special. Fall is great time of year to hear, and possibly even see, a few of the owls that live in Lord Stirling Park. Registration is limited. Please wear appropriate clothing and footwear. Since 1869, this prestigious Victorian castle has been hosting visitors at its 2,200 acre mountaintop setting. Hidden at the top of the Shawangunk Ridge in the Catskill Mountain Range, Mohonk offers spectacular views of an incredible landscape. Take a tour of Mohonk's award-winning formal annual gardens and greenhouse. Enjoy a picnic lunch, wander the trails, and take a moment to relax on the historic grounds. Please bring a bag lunch to enjoy as a late summer picnic. Spend the day at the Environmental Education Center participating in our Fall Birding Workshop. The workshop will feature a morning bird walk searching for warblers, a hawk watch from the back deck, a series of identification lectures, and more. Lunch will be provided. Please wear appropriate clothing and footwear for a full day of activities. Lace up a pair of comfortable walking shoes, pack your favorite bag lunch, and join the Naturalists on a tour of the historic house and gardens of this beautiful 25 acre property. With a variety of formal gardens including a large display garden, pollinator garden, cutting garden, xeric garden, cacti and succulent garden, rain garden, rock garden, and a woodland path, there is something for everyone to admire. A late afternoon stop in New Hope/Lambertville to stretch the legs is planned as time and weather allows. Calling all tots! Leave the stroller behind and join a Naturalist for a walk on the trails of Lord Stirling Park. Explore the natural world around you by using all of your senses! You will be surprised to find out how much fun you can have outside! Pre-registration is required. Is natural science a subject you find interesting? Do you like the outdoors? Is the Great Swamp a place you like to visit? If so join us at the Environmental Education Center and contribute your talents to our fun and educational projects and special events. Pre-registration is required. Gretchen Rotondo at 908 722-1200 ext.5323 or email your completed application and waiver to grotondo@scparks.org. Corporate Volunteer Groups please contact Daniel Ross at 908 722-1200 ext.5336 or dross@scparks.org. The building is open 9am-5pm daily. Exhibits are open 9am-4:30pm daily. Registration is accepted 9am-4:30pm daily. The building is closed on Holidays. Trails are open dawn to dusk daily but closed on Deer Management days as scheduled. Have a question about a plant or animal species you saw in Lord Stirling Park or northern New Jersey? One of our naturalists can help you! Complete the form and an EEC staff member will do their best to solve your nature mysteries!